As you may or may not have gathered by now, I am a bit of a butterfly when it comes to projects. I flit from job to job, never really finishing anything before moving onto the next. I dabble a bit here, paint a bit more skirting board there, start a completely new project somewhere else, before abandoning it half way and moving onto something else. When it comes to this house, I sometimes feel so utterly overwhelmed by quite how much I have to do, that it can very easy to plonk myself down and get into what can only be described as ‘a bit of a tizz’! I had this weekend to myself, so I decided to paint my landing, an area which I think makes all the difference to a house if it’s light and bright. In one end of the corridor, there was a corner of wallpaper peeling. In true Tamsyn style, rather than leaving it alone, or even just sticking it back down, I pulled it away from the wall. Then I pulled a bit more. Fast forward ten minutes, and I had pulled two panels of the old paper away, and half the ceiling paper covering, which now needs re-skimming. I then decided to step away from that project and do something else!! 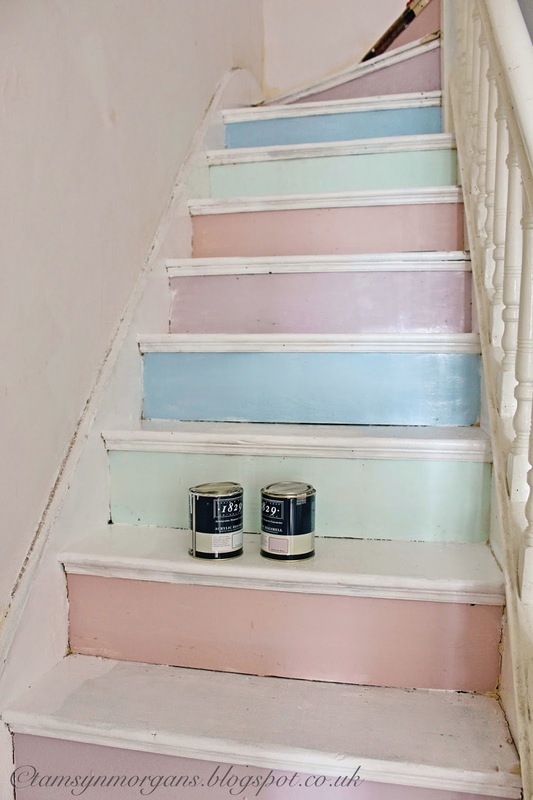 I saw this idea for pastel coloured stairs on Pinterest, and knew it was what I wanted to do. 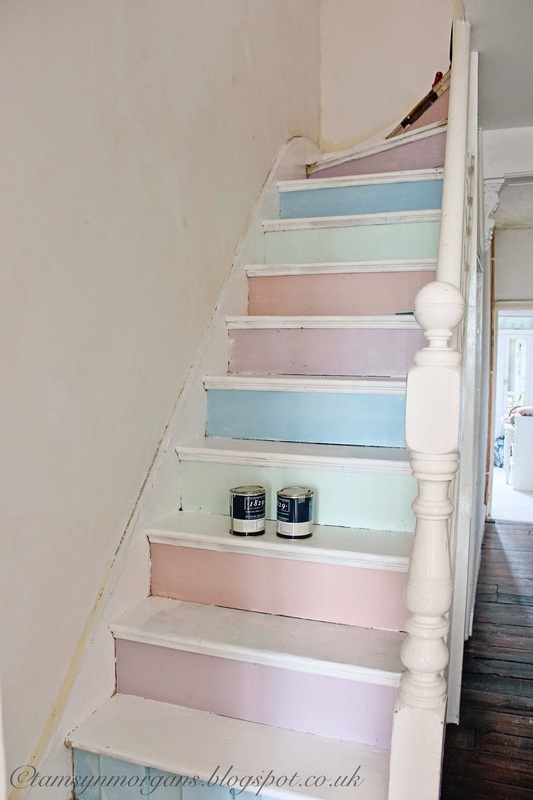 If I can’t have a pastel striped beach hut of my own, at least I can have a pastel staircase! 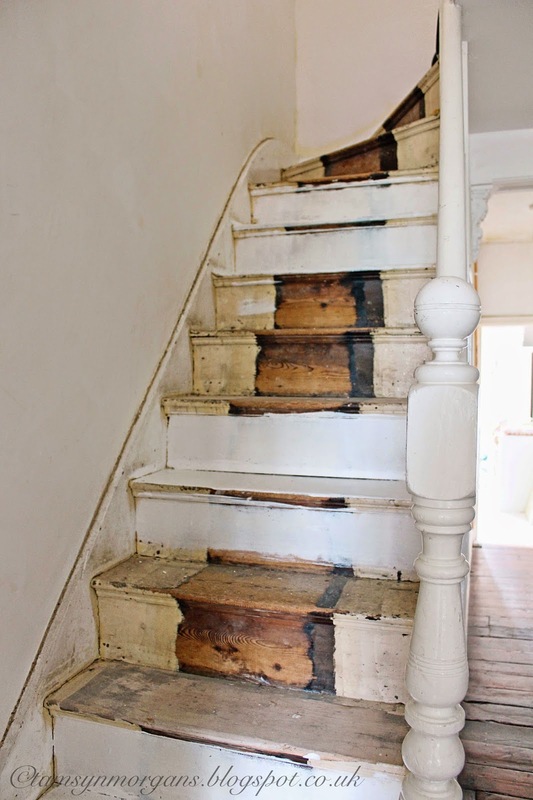 The old stairs are very shabby, and really I should have spent some time preparing them, and filling the gaps and cracks. However with one failed project behind me, I needed to feel that I had accomplished something, so I decided to go for it. These pictures are very much a work in progress, but I’m so happy with what I’ve done, I couldn’t wait to share it with you! Sometimes with a project this big, you need to just follow your instincts, have some fun, and go for it. I also started painting my bedroom this weekend – in my book you can never have too many projects on the go at once!